The Superior Octopus #1 review: Superior, indeed – AiPT! The final step into Spider-Geddon is a success. Each Spider-Geddon prequel book has been equal parts character piece and event leadup, letting us see inside the suits of these Spider-men-and-women while also getting the key players into place for the direct sequel to one of the best Spider events of all time. On those grounds, how does The Superior Octopus from writer Christos Gage, artists Mike Hawthorne, Wade Von Grawbadger, and colorist Jordie Bellaire fare? Well, it’s a mostly thrilling, fun, and absolutely enthralling story that makes the follow up, largely perfunctory feeling, “Check in” story from write Jed MacKay and artist Mark Bagley pale in comparison. DOC OCK-TOBER STARTS HERE IN THIS SPIDER-GEDDON TIE IN! Doc Ock has set up shop as San Francisco’s protector, but you won’t believe his methods. Some of Otto Octavius’s new super hero strategies may make Spider-Man regret letting him free, but the good doctor swears that he’s the SUPERIOR OCTOPUS! That’s fairly accurate too, as Gage sets out introducing us to the new and improved Otto by way of a scene where he hires some D-list supervillains to keep an eye on San Fran for him, casting a wider net of surveillance and spreading the word about the Superior Octopus’s watchful eye. Not methods Spidey main (Spidey proper? Spidey alpa? Peter Prime?) would use to say the least! But, as with his introduction of the PS4 Spidey in an issue prior, Gage revels in this expectation shifting, character-focused narrative work that gives a real earnest, focused energy to what otherwise might be outlandish twists and turns later in the issue. Otto’s clinical, abrasive, and haughty thoughts clutter the pages in a compelling train of thoughts that bounce between heroism and flights of fancy that err towards villainy all with a sharp wit and precision I don’t feel many writers other than Gage could deliver this well — highlighted even more so by the clumsiness of the “Check In” issue following, which merely serves its purpose in establishing the return of the Inheritors. It’s both fun and appropriate writing that establishes real character quickly and effectively, utilizing what little time the issue here has to get things headed into Spider-Geddon proper very well even if things do take a Hydra-laden turn and feel a little too unbelievable by the end. Similarly, the Octopus-focused artistic efforts indicate a singularity of vision that bring all of these artists’ strengths to the forefront without highlighting many of their flaws. 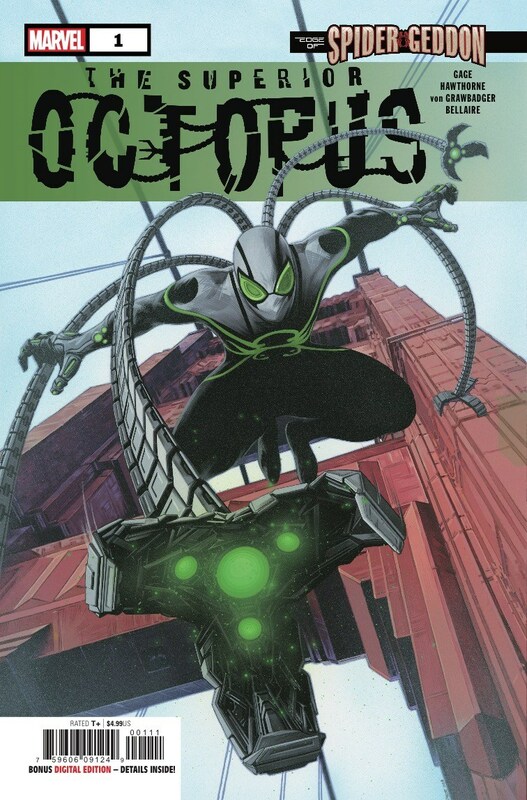 The fluidity with which Octopus is drawn, the sleek silver of his suit offset by the forest green, the imposing angle with which he looks down on his foes — it’s all very intentional and honed in the same way the narrative is to great effect. The same can’t be said, unfortunately, for the “Check in” story, where Bagley focuses too much on characters’ faces, often cropping interesting or dynamic issues out of the story completely and leaving what could’ve been some dramatic tension feeling lacking. In the end, as with Gage’s writing Spider-Geddon #0preceding this, it’s as apparent as ever that he is a fantastic choice for the coming Spidey reckoning. One who understands both character and pace to fantastic effect and has a taste for fantastic comic fun as well. After much hemming and hawing over the direction of the story following some uneven individual issues, I think it’s safe to say we’re in good hands. The final Spider-Geddon prequel should assure readers that they're in good hands with Christos Gage who writes a compelling, smart, character-driven narrative full of fun twists and turns. However, the follow-up "Check In" story here doesn't fare as well. Gage is a master of writing characters who feel different and dynamic, each line is impacting and fully voiced. The Octopus artistic team is firing on all cylinders offering up a totally realized and fluid look for a cool character. The second story here feels entirely perfunctory and characterless, just getting the pieces into place for better things to come.